QuickTime Pro 7.2 offers new export presets for the iPhone and other mobile playback devices -- both via WiFi and cellular networks. This makes it easy for digital photographers to share the movies they capture with their compact cameras. The iPhone provides excellent video playback, and many other mobile units do quite well also. Preparing the video for these devices is a snap. First, capture the movie with your digital camera at the highest quality settings possible. This leaves your options open for other uses up the road, such as DVD burning for TV playback. Then make sure you have the most current version of QuickTime Pro. Open the movie, choose File > Export, then select the compression preset from the Export pop-up menu. 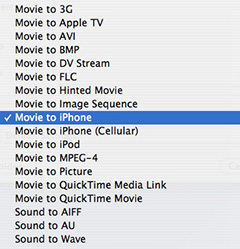 If you're preparing your movie for high quality playback on the iPhone, choose the "Movie to iPhone" option. If you want to stream movies over a cellular network to other mobile users, choose the "Movie to iPhone (Cellular)" option. (There's also a very nice "Movie to iPod" option for video-enabled iPods.) To give you a feel for the size differences, I started with a 20 MB video, then tried the two different export presets. The higher quality "Movie to iPhone" rendered a 3.1 MB file, while the Cellular version was smaller in dimensions and file size (348 KB). If you want to learn more about movie capture with your digital camera, listen to Podcast #3. You can also download the QuickTime 7.2 User Guide from Apple. Also keep in mind that the Most Excellent (and worth the $23.32 you need to pay for it) VisualHub (for the mac) has presets for the iPhone as well (updated within days of the iPhone's specs being released). I recently flew from Seattle to Honolulu, and wanted some content to watch. I used the VisualHub iPhone "wifi" setting (in the middle of the quality slider) and did *not* use H264 (I was in a hurry to get them converted). A one hour television show converted in about 6 minutes, and used 250 MB of storage. The result was stunning to watch. I watched about 3.5 hours of video this way, and my battery didn't dip below 70%. I presume this is non-linear, however, as I've seen some reports say that you'll get only about 5 to 7 hours of video watching on a single charge. Advantageously, the article is actually the freshest on this precious topic. I concur with your conclusions and will thirstily look forward to your next updates. Just saying thanks will not just be sufficient, for the phenomenal clarity in your writing. I will immediately grab your rss feed to stay abreast of any updates. Fabulous work and much success in your business enterprise! I'm Looking for a project to volunteer in this might not be on topic but is there anything you can recomend me? I would really apperciate it thanks!